Is it a man, a mermaid, a beast or simply a rock? This undated image of the surface of Mars, was taken by Nasa's explorer rover Spirit. It has re-ignited the debate about life on Mars. We asked you what you thought the picture depicted. Some of your comments are published below. Nasa are bound to know the coordinates of where this picture was taken and so they should return again to take a picture of the same place. If the object has moved its a lifeforn, if not its a rock! Use your brains!!! The figure on Mars is not striding, clearly it's arm is outstretched quite recognisably thumbing a lift from the Rover. Loch Ness Monster all over again! 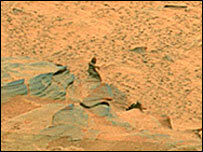 Could just be a strange rock formation, the picture is just vague enough to cause speculation. I think these are rocks on the mars. Nothing new one, there is no any possibility of life on mars. it looks like a man, but maybe there were life on mars but i don't think there are life on mars now! I think it is not a mermaid it is a stachue. Why are we so arrogant to think that martians - if they do exist - are going to look anything like humans? All sci-fi fiction uses this assumption and its a load of rubbish. It's a tiny rock formation caused by centuries of wind. It must only be a few inches tall. Its quite obviously a rock. People can just seeing what they want to see. Its like an intergalactic version of cloud watching. Its a cut scence from a star wars movie i.e. sandpeople.NEXT! Well, considering it doesn't even look like any living creature spare the shape that resembled a head and body, which more than likely would not be the resemblance of an extraterrestrial, i don't think it is anything more than a rock or shadow, dirt on the lense or trick of light. Especially since for there to be life, there needs to be a source of fuel, nothing we can see on mars is fuel, so if it was a alien, its not from mars, if it is from another planet. where are the others? its ship? and why are they stopping to sit on a desert planet out of sight of their ship, leaving our robots alone and not at earth now? Is it not the case that the "Red Planet" is only red because of the atmosphere, and not because of the colour of the surface which is grey. And that NASA photos are doctored to uphold the belief that it is Mars by fitting along with the general consensus that it should be red. If they showed the original grey photos then everyone would say "that can't be Mars it's not red". In the end though. I think it is a rock. like, that's clearly a bloke innit. why is Nasa trying to hide this from us????? THATS THE REAL QUESTION! they know about alien life. I'm not saying it's like men in black or nothing, but it ain't far off innit. NASA release a photo when the approval rating of the programme is at an all time low. Coincidence? No? Hey its Elvis. "Elvis has not left Mars". You could be right, i am a big believer in life after the earth. I have worked all my life on looking for life out there, could this be a breakthrough. Let's hope that it is true. If people are saying its a "moving OR static" thing then why not just have the rover go to the same spot and take another image. Then move around and take other images to see what it looks like in 3D? It just seems to be eroded rock. I am sure if 10,000 eroded rock are looked at some of them will look like something. Rocks on earth are named after what they look like all the time. We even see patterns in the position of stars in the sky. No little green men needed. Who'd have thought it? Fancy meeting our first alien on Mars and it's not even a Martian. That much is clear as there is no evidence of aerials on top of the creatures head. What do I think? I think it's the biggest pile of garbage ever. To me it looks nothing like a human figure. The so called "arm" is probably just a bit of rock sticking out, and people, as usual, have jumped the gun and proclaimed that there's life on Mars. To me, "Life on Mars" (not the TV programme, though I suppose you could include it)is just Sci-Fi nonsense. While we're at it, why don't we all start looking for Chewbacca and the Wookies? It's obviously a bigfoot carrying a case of Kokanee Beer. Looks just like the one in the commercials and on the labels. (A very good Pilsner by the way) Or people have been drinking to much beer when they see something other than a shadow from the rock formations. At least it has people talking and thinking about space exploration. An Angel having a think about what he just sore on earth and getting ready to watch Harmagedon. I have my doubts that this is a real living creature. It more like shadows and rocks if you ask me. But each to their own and if someone wants to think there is life on Mars then good on 'em. Life it is. These are my thoughts so, take 'em or leave 'em. Pam. Brisbane, Australia. Cool though life on Mars would be, I think it's more likely a perspective or optical illusion. Shame really! We can speculate until the cows come home, but until John Q Martian makes a televised announcement shaking hands/flippers/tentacles with the President of the United States (before being carted off and dissected to prove scientifically that he is indeed an alien - John Q that is, not the President) I shan't believe any of it. And believe me, I want to believe. It's a rock. Big deal. Let's not forget the loch ness monster photos. I'm sure it's not a person walking across. However, it does look like some kind of statue, possibly built by aliens. My imagination perhaps, behind and to the left of the image it almost looks like letters in the sand, OS or OSi???? Their doesn't seem to be anything like that anywhere else in the image or at least not that clear. Why don't they just send the rover back to take the same shot again, If as I suspect the figure is still there its obviously a rock formation (or a martian sloth), But if its not there, now that would be interesting. Maybe it is the little green mermaid. Mind you, with so little water on the surface of Mars, I don't think she tempts too many sailors to wreck their boats. Why is it always the case that a blurred or far away image of something 'alien' is shown? I do realise there is a great chance for something extra-terrestrial to exist in this huge universe but solid proof is needed to make me and others believe.